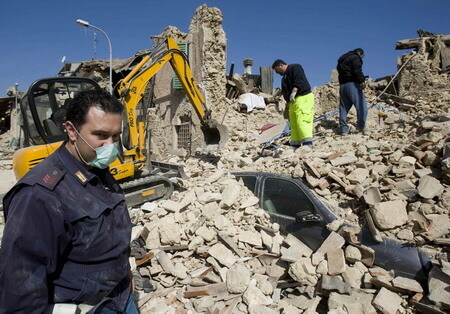 L'AQUILA, Italy -- A powerful earthquake in mountainous central Italy knocked down whole blocks of buildings early Monday as residents slept, killing more than 70 people in the country's deadliest quake in nearly three decades, officials said. Tens of thousands were homeless and 1,500 were injured. Ambulances screamed through the medieval city L'Aquila as firefighters with dogs worked feverishly to reach people trapped in fallen buildings, including a dormitory where half a dozen university students were believed still inside. Outside the half-collapsed building, tearful young people huddled together, wrapped in blankets, some still in their slippers after being roused from sleep by the quake. Dozens managed to escape as the walls fell around them. "We managed to come down with other students but we had to sneak through a hole in the stairs as the whole floor came down," said Luigi Alfonsi, 22. "I was in bed -- it was like it would never end as I heard pieces of the building collapse around me." In the historic center of the city, a wall of the 13th century Santa Maria di Collemaggio church collapsed and the bell tower of the Renaissance San Bernadino church also fell. The 16th castle housing the Abruzzo National Museum was damaged. L'Aquila, capital of the Abruzzo region, was near the epicenter about 70 miles (110 kilometers) northeast of Rome. It is a quake-prone region that has had at least nine smaller jolts since the beginning of April. The quake struck at 3:32 a.m. The U.S. Geological Survey said the big quake was magnitude 6.3, but Italy's National Institute of Geophysics put it at 5.8 and more than a dozen aftershocks followed. More than 70 people were killed and the death toll was likely to rise, civil protection chief Guido Bertolaso said as rescue crews clawed through the debris of fallen homes. Some 1,500 people were injured.